Last year the Summer Solstice horoscope showed difficulties and many folk would agree that the 2016 campaign and election were trouble enough for their oddities, insults, hacking, falsehoods, exaggerations, intolerance, and overly Republican outcomes. Now it seems that our Republic is being tipped off its rails to a point of chaos, some say, so let's look ahead to the horoscope of Summer Solstice 2017 (set for Washington DC) to see if perspective can be gained concerning our nation's summer season until Autumn Equinox (aka, the Libra Ingress) rolls around in September. And note that Summer Solstice 2017 falls within the purview of the February 26, 2017 Solar Eclipse in the 19 South Saros Series while Autumn Equinox 2017 will occur after The Great American Eclipse of August 21, 2017 in the problematic 1 North Saros Series (August 11, 1999's 'The Mother of All Eclipses' that influenced the current Age of Terror, and the New Millennium. As you know, eclipses provide background influences within the Collective and often bring a disruptive 'wild card' Uranian flavor of unpredictability, new elements or trends, revelations of secrets (via leaks and otherwise), disruptions, and/or sudden changes of direction to the proceedings. 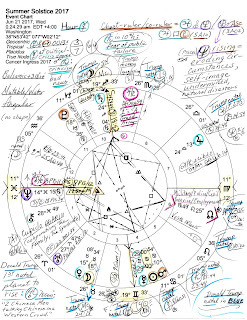 A colorful chart, yes, but hopefully you'll enlarge the image and read my study notes for not all can be discussed in this text; Mr.Trump's natal planets are in blue around the outside of the chart; two US natals from July 4, 1776 are penned outside the horoscope, too, but are not colorfully highlighted--US natal Moon conjoined by transit South Node (tail of the dragon) in the 12th house of Karma and Politics, and US natal Saturn in mid-Libra once again hit by transit Jupiter, a period when restrictions or limitations may be partially lifted. As you see, nebulous watery Neptune rises denoting on its worst day, large issues or catastrophes that bring tears to many eyes. Through its own sign of Pisces, Neptune is proving its importance within the Collective Unconscious that it encompasses with its 12th house association and rulership of shady Pisces. Chiron is in 1st house, too, and brings its mentor-ship when in Pisces along with its wounding/wounded-healer qualities that the victim-savior axis of Virgo-Pisces can appreciate. Is this first-house picture a view of the Republicans' Obamacare 'repeal' that dis-insures millions of Americans? Well, Neptune is one of the loss-bringer planets and was sitting atop US natal Moon when the ACA (Obamacare) was signed into law on March 23, 2010 giving the law a very iffy basis for its existence. For me, the GOP stance and arguments against Obamacare would have slightly more credibility now if they hadn't worked so hard to undermine it from the first. The ACA is a "failing law" they say, and they should know since they worked for years to make that happen. Okay, many more chart factors are worth discussing and maybe we can do that later. 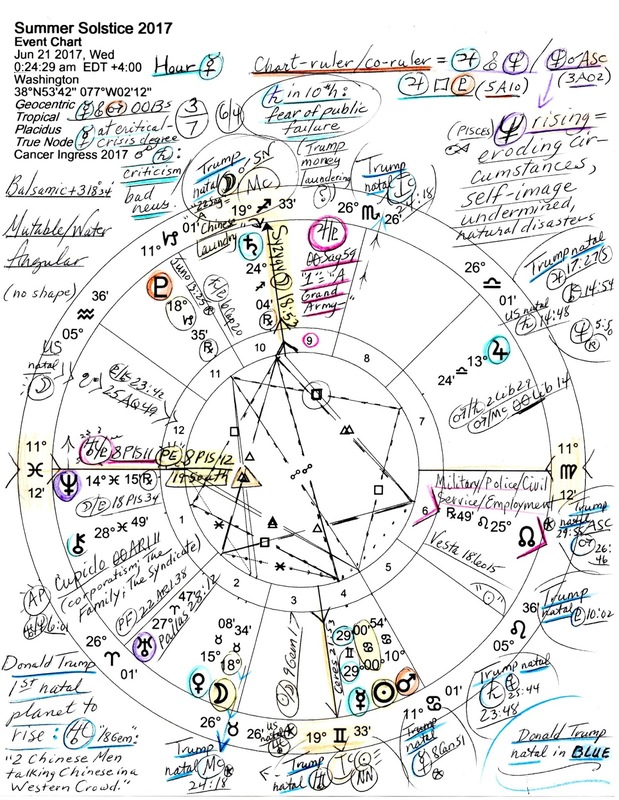 For now, here's a view of the Summer Solstice chart with Donald J. Trump's planets scribbled around it and his quirky leading planet Uranus the first of his natal planets to rise in the chart. Looks like it's going to be a chaotic Uranian summer. Meanwhile, we can expect Mr. Trump to get in lots of golfing as the weeks go by. No worries on that score. You may also wish to see: Summer Solstice 2017: Sun Cancer-Moon Taurus. Edit March 4, 2017: heads-up on a new addition to the sidebar to your right - a link to an article concerning America's famous (or infamous) Manifest Destiny: Doing the Unsavory Work of God.